There is a rat race going on between the big brands and companies, every now and then we see a new gadget, a new device and a new smartphone is breathing in the hands of people. I wonder what will come on the face of earth after all this technology. The touch experience has taken us to some other level of convenience and we certainly cannot believe a life where such commodities don’t exist. Life without these cellular gadgets is now almost impossible. Every little kid or adult wants the best smartphone in his hand no matter how costly it is, we just want to have the best of everything for ourselves. Well who doesn’t know about Samsung, the largest selling brand around the globe that has been serving the world since ages, with every new device unearthing they are getting superb and better than before. The excellence of Samsung mobile phones have never gone below the average line. The sets have class, the service is spectacular, the selfie camera is phenomenal and the entire look of the phone is handy. You cannot resist to hold it in public and flaunt the charisma of the phone around. 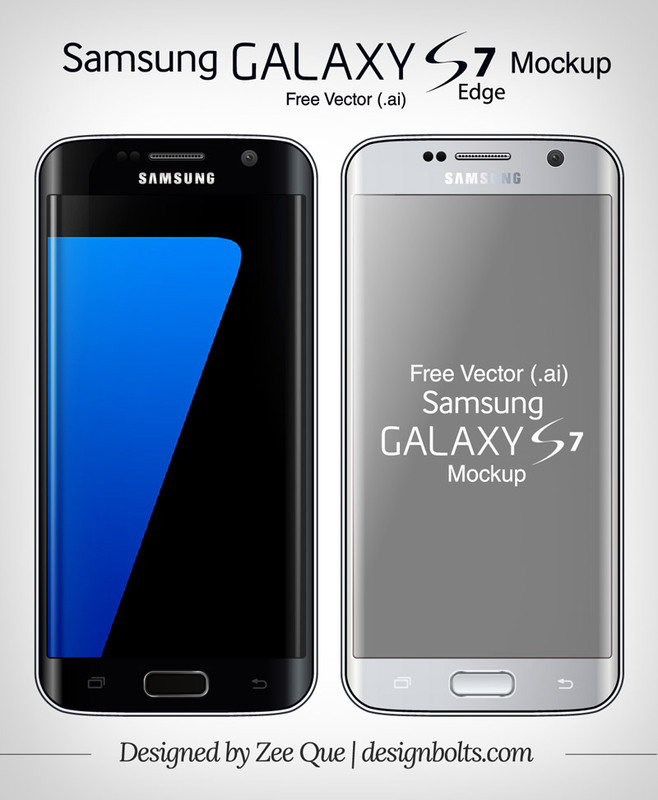 Well lately Samsung has unmasked two of its new smartphones S7 and S7 edge that will be available from 11th march and preorders services are started from February 23rd. I cannot put the elegance of both these sets into words. The pricing has not yet disclosed by Samsung yet we have the idea about its features. S7 is coming with Android 6.0 Marshmallow software having 5.1-inch screen with 2,560×1, 440-pixel resolution, 12-megapixel camera which is water-resistant. The set is available is black onyx and beautiful gold platinum color. S7 and S7 edge are sleeker, with the comfy interface, they have rocket speed and the system is definitely a step up from the previous versions of Samsung galaxy. Certainly an apt choice to go forth. 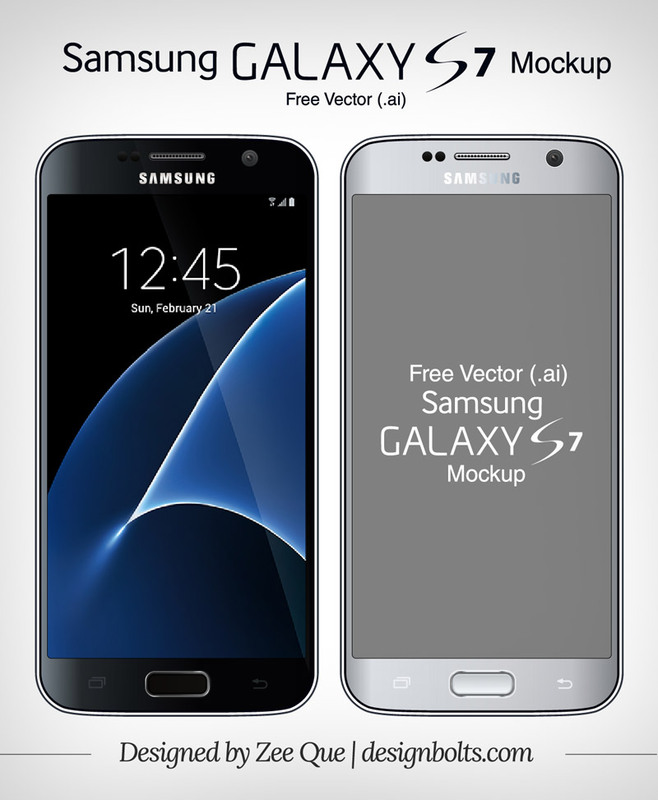 Here I have made a free Vector Samsung Galaxy S7 & S7 Edge mock-up. If you want to display your app, web banners or if you have made the user interface of a video game and want to manifest it in a professional manner then insert in your design element into this mockup to present it to your client. Do check back in for more freebies and we won’t let you down guys, have faith in us. Your feedback is always encouraged. Here we go! That’s not an .AI file. It’s a Photoshop smart object. If you advertise .ai, then deliver .ai please.